Keeping organized in one of the hardest things I struggle with. Not only do the kids run around making more messes for me to clean, but once I DO accomplish one thing off my to do list and sit down, I realize there is one more thing to clean or organize. Now I have a cleaning schedule, chore chart, daily, weekly and monthly to do lists. 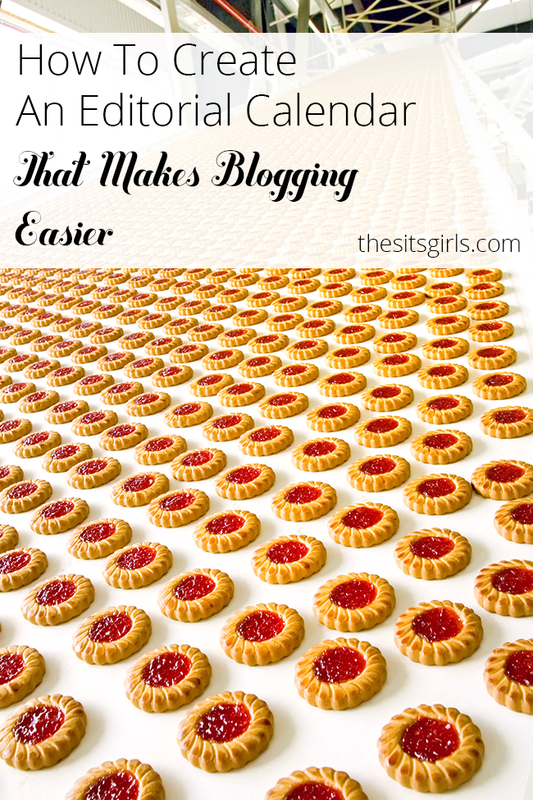 Why not add to the craziness and have a schedule for blogging? I honestly had not ever scheduled things until recently. I am scheduling posts a month in advance now and you know what? I HAVE MORE TIME TO RELAX. My blogging calendar has changed my online life. Out of all the blogging tips and tutorials out there, I think this is number one. If blogging is JUST a hobby then this is probably not for you. 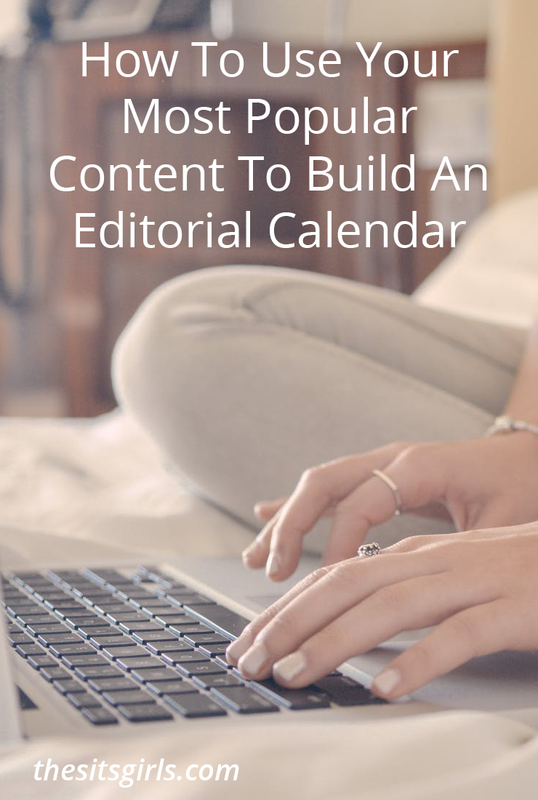 If you are SERIOUS about blogging, growing traffic, and having free time to sit and RELAX, then read on and see what you can do to create your own editorial calendar. I don’t know about many of you but my mind works ALL OVER THE PLACE. 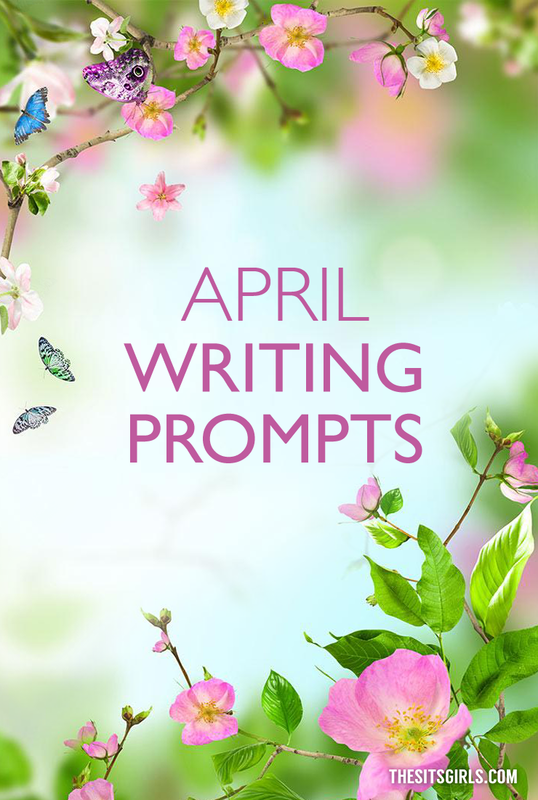 I found I had ideas piling up in the most unusual places-my purse on sticky notes, in the car on napkins, or on the mirror in the bathroom! I can’t just have these perfect little lists of blogging ideas. I keep a smash journal because it allows me to rip pictures out of magazines, color swatches, doodle, and glue in pictures of whatever I want for each post idea. For example, I write about a lot of everything, but I try to follow a monthly theme and disperse each post into each category. This way I am not leaving one category tagging behind while the rest seem to build upon one another and grow. During my kids birthday months I try to write more about pregnancy, family, and becoming a mom. While November is my anniversary and thanksgiving, I dedicate this month to only family time, marriage, love, and dating. Throughout the rest of the year I dedicate each month to something and follow it. Once you have your lists of post ideas, themes and everything jotted down SOMEWHERE, open google docs and begin labeling! I love google docs and use it for almost everything I do! It is so simple to use and you simply can’t mess up! I love this also because you can change your mind, move the post for later or delete it if some post does not go the way you planned ( Instead of scratching out in pen on paper planners). As you can see from mine above I actually have two separate columns. The left side (which is blank because I began a new theme this month) is labeled by month, date, bay, blog title, and image (If I include one I simply make it with an X). The right side is for Link Parties. I color code them because I only post to 4 or 5 each day for every week. For example, the blue is the first Monday of the month, yellow is the second Monday of the month, etc. Then I have each linked up to that site so I just click and it takes me to the link up right from my google document! 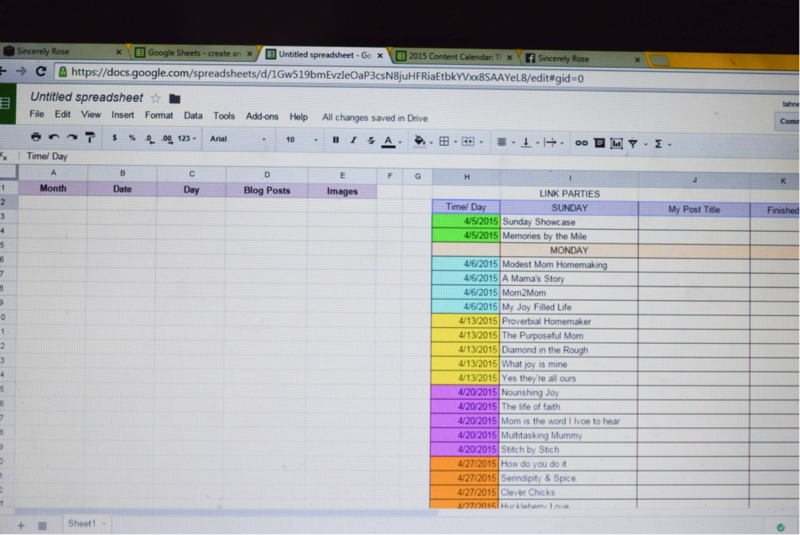 The best (and my favorite) part about using google docs for creating an editorial calendar is color coding! Doesn’t it just make your heart happy when everything is in color? When I see everything in color for each week, I am able to follow my schedule better. I know that one color is for one day and I do not get lost! I have loved having a blogging calendar; it has made me a more efficient blogger. It has also enabled me to schedule out posts a month (sometimes more) in advance. It seems like a lot of work, but it took me about 20 minutes to make the document and an hour or so to link all my link parties on the side. Now writing all the posts is the next step! It can be done, and you can make it your own! How do you organize your blogging each month? 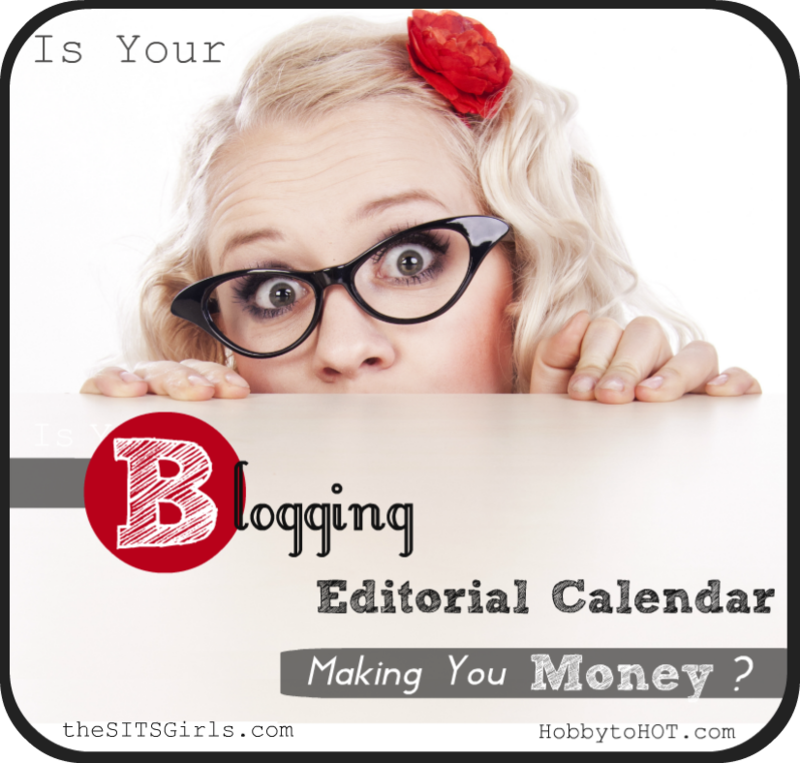 Looking for more information about blogging calendars? Check out these posts to find out how to tell if your editorial calendar is done right and if your editorial calendar is making you money. Tahnee is a Wife, Mother, Professional Hairstylist, children's book connoisseur , and lover of home-style cooking. She worked in the salon for 7 years until venturing out and starting her own Hair & makeup business to stay home with her two babies. She will be graduating in Graphic Design this summer and is thrilled to open the next section of her business! She is passionate about many things in life, and hopes that through her blog, she can bring a little "motivation for mommies" in all areas of life.Being a mom has taught her to celebrate each day as it comes, even if that means wearing the same pair of sweats and a t-shirt AGAIN with a new shade of lip-stick. Each day needs a little "oomph" to it, and her hopes are to add just that when you are reading. You can visit her personal blog at Sincerely Rose. She can also be found on Facebook, Pinterest, and Instagram. I love Google Doc’s and spreadsheets too! They are so easy to arrange, rearrange, organize, and link. Thanks for the great tips. Fantastic tips! I love the idea of a smash journal! Thanks for sharing, I need to start optimizing Google Docs and give this a go! The smash journal has been the best investment for me EVER! Try out google docs and let me know what you think! Good Luck! Ive been thinking about an idea smash journal for a while now. Think I might go out and get one today. And recently I have created a type of editorial calendar, but have not implemented the concept I have in my mind fully. I have stayed so organized with my smash journal! 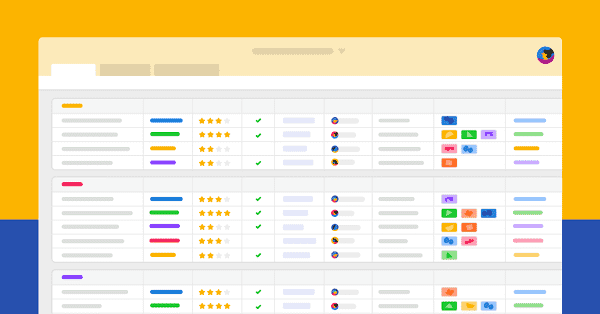 It is easy to add or remove anything all on one page! I think the hardest part is taking the time to sit and put everything together just the way you are thinking 🙂 Good Luck! Great post!! You had me a color coding 😉 I have about 8 billion “lists ” on my phone- I need to get that on some google docs! I have also used some printables I found on Pinterest that lay out the week/ month/ year and you can check off social media scheduling, etc. has helped me through this launch phase for sure! I also have a clipboard with a lost on it by my computer of all the sizes photos need to be for different social media posting and the best times to post! Google docs has come to my rescue recently when I lost my phone at the airport! You never know when something like that will happen. I am so glad I had it on a saved sheet online! It sounds like you have everything you need to get you in the right direction! Let me know if this helps you even more!